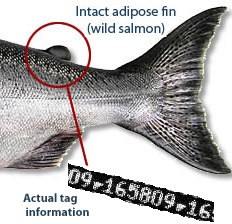 In 2014, we secured a permit through CDFW to examine the carcasses of salmon as a means of supporting their data collection on hatchery fish. Further, we were authorized to take fin samples from fish that had an adipose fin to determine their origin by using DNA testing. Little is known about these fish, but the Lead Agency insists that they are strays from the Central Valley hatcheries. At the end of the 2016 run, SBCCC had turned over (4) heads for analysis; CDFW biologists reported back that these hatchery fish had been introduced at the following locations for release into the wild: (1) San Pablo Bay, (1) Santa Cruz harbor, and (2) Half Moon Bay harbor. Our efforts in 2017 led to (7) heads being turned over to the CDFW and currently, we await to hear of their findings. During the Fall of 2017 and going until Winter 2018, SBCCC launched a monitoring program bringing together over 30 volunteers, which included our local Flycasters of San Jose. The group was trained on identification of REDD’s and on how to tag sites with GPS coordinates. All of the data created went into a database to create the living map. We have captured pictures and videos documenting the late fall-run of the Chinook salmon throughout the Guadalupe watershed with over 300 volunteer hours. Special thanks to everyone who participated, especially Santa Clara University who entered our dta into a mapping software program called ARCGIS which made all of this possible. We look forward to expanding this program in the coming years. A complete map of the spawning activity for both last year's Fall run and this current years Fall run can be found in our Interactive Maps. Access it here. A video of the 2017 late fall-run Chinook salmon along the Guadalupe Watershed. This year, reclaimed stretches of our waterway began seeing the return of spawning activity, even though the previous assumption was debunked that sediment issues rendered much of the gravel unsuitable for spawning, as these Chinook had no difficulties digging up their REDDs. And we confirmed successful spawning as evidenced in the video below showing the emerging fry along major stretches of the Los Gatos Creek and the Guadalupe Watershed. Steelhead Study in 2014 with UC Davis’ Dr. Hobbs and Santa Clara Valley Water District. This study was conducted in the midst of our drought with a limited number of fish sampled. The activities you are witnessing were coupled with downstream antennas stretched across the Guadalupe to monitor if any of these Rainbow trout migrated out into the Bay, thus becoming steelhead. Of the two fish captured and released, one was located in the slough area near the salt ponds , which confirmed that we have steelhead activity along the Los Gatos Creek and the Guadalupe Watershed.